As we’re witnessing in communities from the Middle East to Wall Street, people are taking it upon themselves to organize and effect lasting change on behalf of the triple bottom line (being economically, socially and environmentally beneficial). These groups aren’t advocating having swarms of people as a better structure for governance, they’re just tired of what’s known in business as the ‘Big Head‘ (represented by the red in the graph above) having too much control, such as in placemaking. Five years ago we posted a series on the rise of the ‘Long Tail’, which is essentially, ‘everyone else’ (represented by the yellow in the graph above). It’s safe to say that the Long Tail, aided by the community-building efficiencies of the Internet, is hitting the tipping point of being a positive force for change. 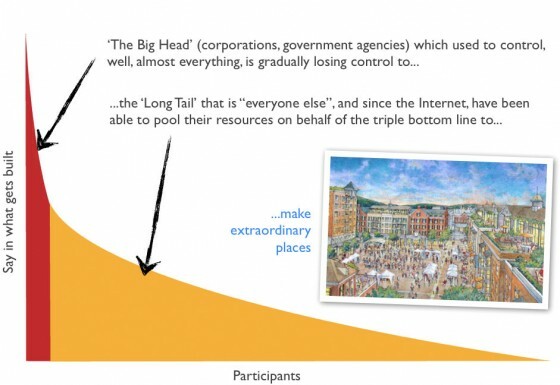 However, it’s not about the Big Head vs the Long Tail. If a conference in Roanoke, Virginia in October 2011, kicking off the Small Cities Movement has anything to say about it, it’s that the ‘Big Head’ and ‘Long Tail’ need to work together, collaborate, and most importantly, learn to like and respect one another. Case in point: Ed Walker. He’s a developer, and he’s clearly in the Big Head, developing over 200 units of attainably-priced housing in downtown Roanoke where there were none before. However, unexpectedly, the Long Tail of artists, creatives, entrepreneurs and everyday folk in Roanoke not only respect him, they see him as a friend. The camaraderie and talent at the conference was extraordinary, and Ed was the one who initiated the plan: Have the CityWorks(X)po launch a Small Cities Movement. It’s the kind of trusting Big Head-Long Tail partnership and culture that allowed the Envision Roanoke crowdsourced placemaking website to go from “Hey, why don’t we develop a website to capture people’s ideas at the conference…” to “We’d like to announce that envisionroanoke.com is now up and running…” in five hours. That’s not a technical feat, that’s a community culture feat.